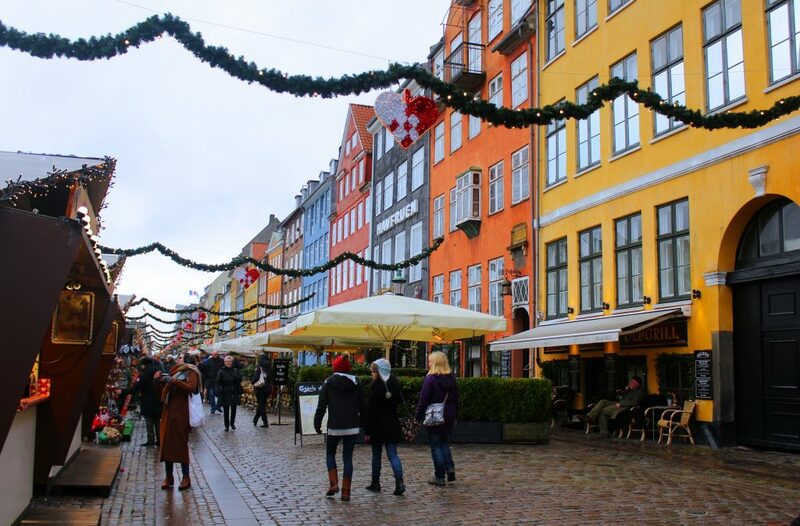 Copenhagen, Denmark is a gorgeous place to spent the holiday season: the lights, the decorations, the food, and of course the beautiful markets! For a relatively small capital city, Copenhagen has plenty of wonderful Christmas markets to choose from. 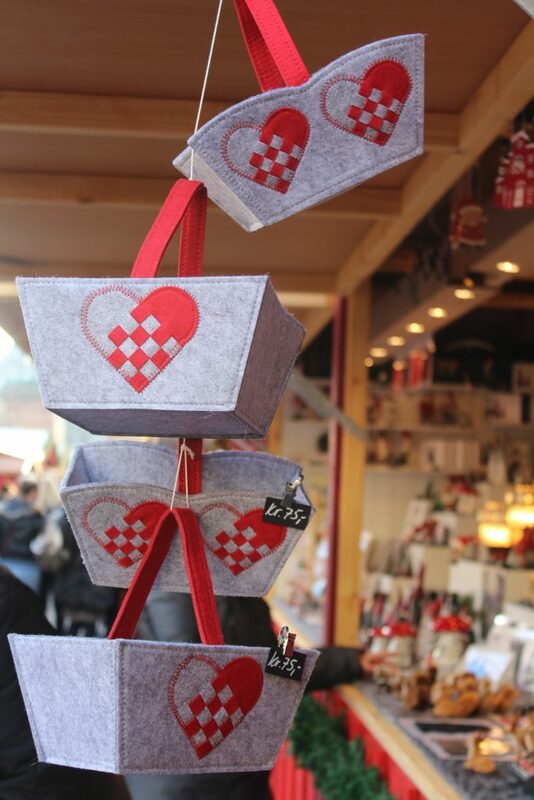 Here you can take in the festive feeling and browse the stalls for Christmas gifts while sipping on a hot gløgg (mulled wine) or nibbling on some æbleskiver (dough balls with jam and powdered sugar). 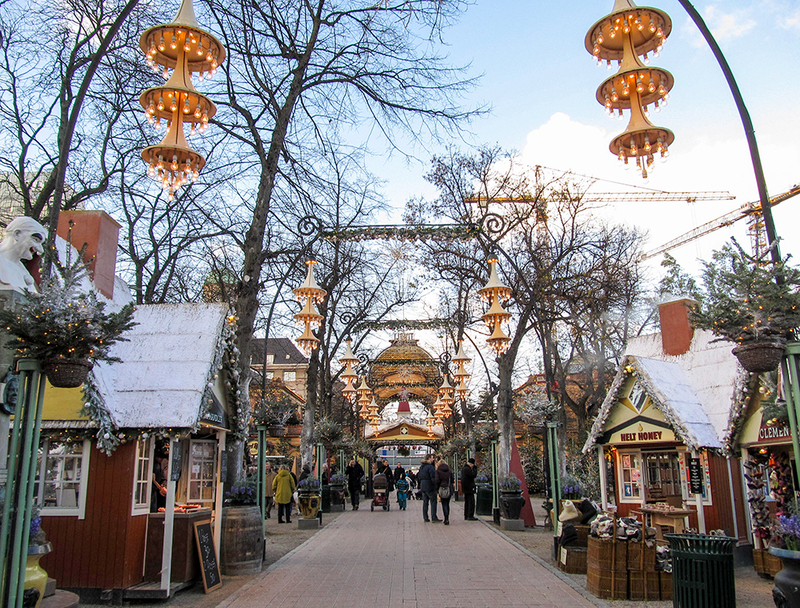 A wonderful place to visit any time of year, there’s just something about Tivoli during the holiday season – it’s the ultimate Copenhagen Christmas experience. This nostalgic amusement park dating back to 1843 comes alive with shimmering lights and quaint wooden huts offering up festive wares like woolen knits, Christmas tree decorations, chocolate treats, and much more. This year, Tivoli has a train theme, with many of the stands being housed in old-fashioned box cars centered around a station, and there’s even an old engine for the kids (or kids at heart) to climb inside for a closer look. 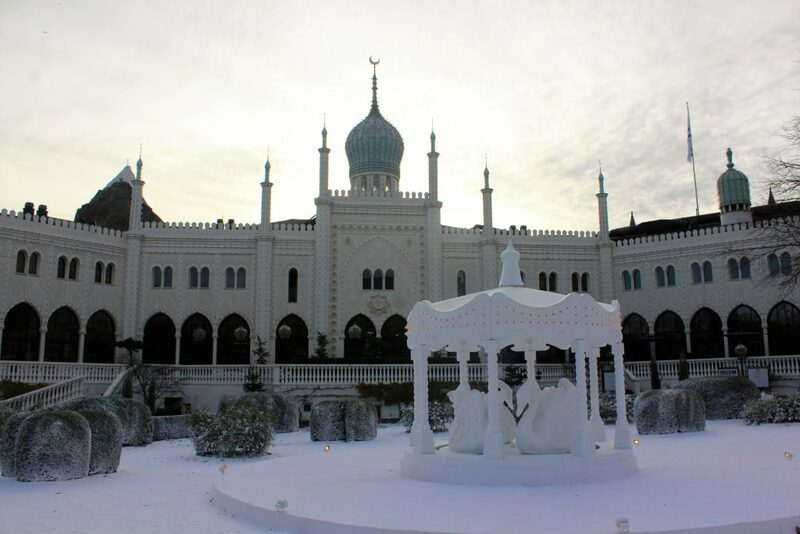 The Arabian palace-style Hotel Nimb shines with white light, an ornate swan carving on its faux-snow dusted lawn, and the towering Christmas tree sparkles with ornaments. At the Julemands Stue, children can visit Denmark’s Santa, the Julemand (the Christmas man) and parents can purchase a souvenir photo of the occasion. Just out front, a small carousel, where even the youngest can take a spin, and in fact all of the park’s rides are open for thrill-seekers. 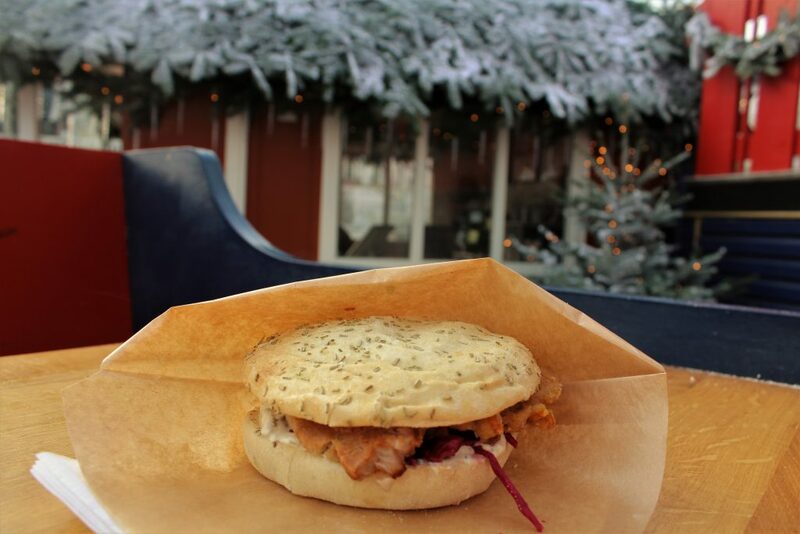 Of course, Tivoli also has a wonderful variety of festive food and drink to try, including the city’s best flæskesteg sandwich – sliced roast pork with crispy crackling with red cabbage, pickled cucumbers, homemade dressing, and a modern twist of a focaccia bun. It’s a true taste of Danish Christmas! 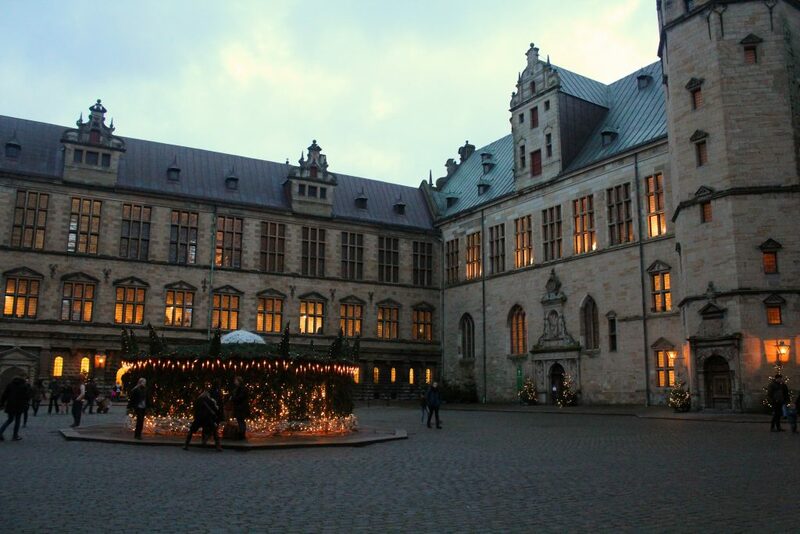 For a bit of an adventure, jump on the regional train north to Helsingør, where you’ll find an Renaissance Christmas market at the beautiful Kronborg Castle, Shakespeare’s inspiration for Hamlet’s castle. 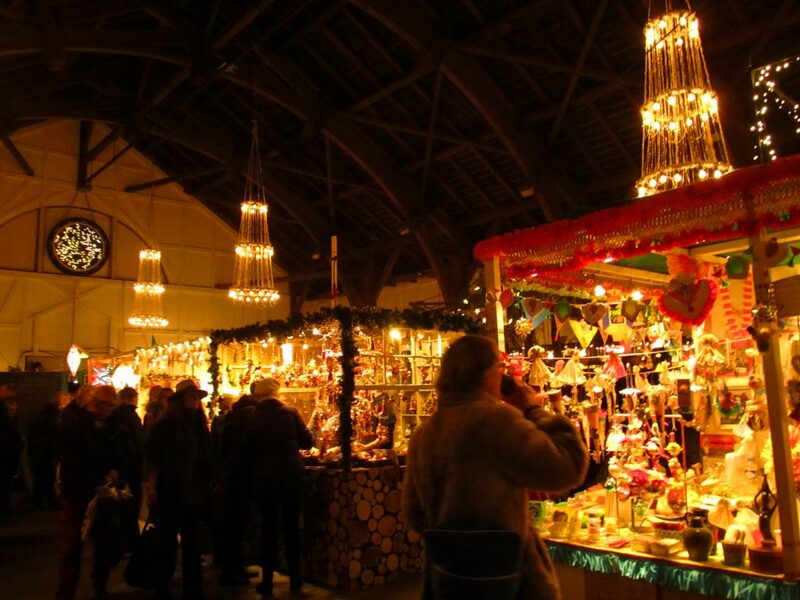 The winding halls are laden with stalls offering Christmas decorations, handcrafts, clothing and jewellery, while down in the candlelit cellar there is a food market with free samples and plenty to buy to savour later – liqueurs, baked goods, meats, herb mixes, and more. There are classical music performances, shows for the kids, and dancing around the Christmas tree in the sweeping ballroom. 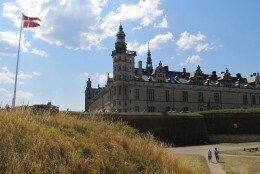 You can also explore the historic rooms and exhibitions of Kronborg. This market may be small, but it’s the setting that makes it special. Located at Copenhagen’s most famous locale, the colourful harbour of Nyhavn, little huts line the famous waterway, selling woolen knits, Christmas decorations, hot gløgg, and tasty fudge in countless flavours (try the caramel apple cinnamon!). 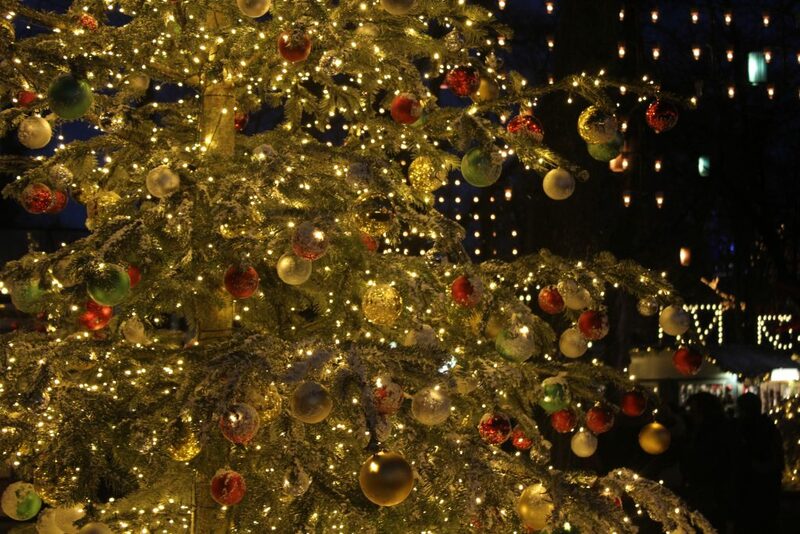 Garlands of greenery, lights, and Christmas hearts hang overhead, contributing to the festive atmosphere. Kongens Nytorv is perhaps Copenhagen’s most bustling hub, and though much of it is taken over by the construction of the new Metro line, it still manages to host a charming market. Though it doesn’t look like much from the outside, once you enter the maze of wooden cabins, you find yourself among stalls packed with Christmas goodies. 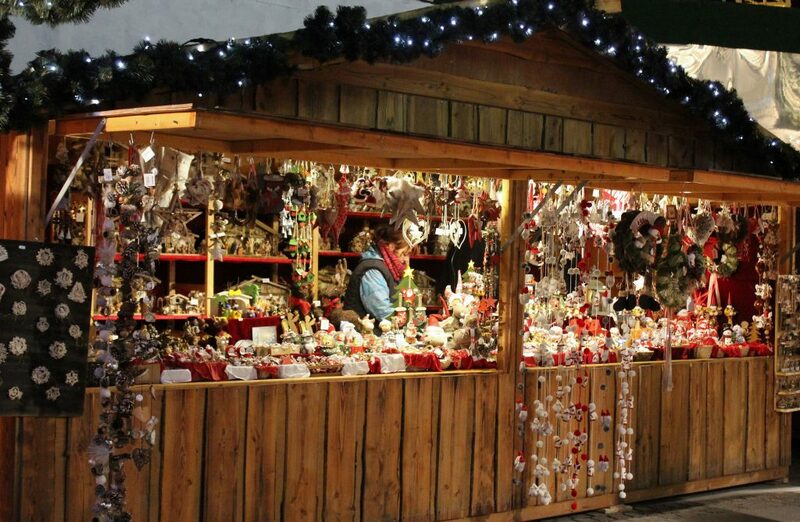 This is a great market for holiday foods of all kinds – German flammekuchen, Hungarian langos, and salmon cooked over an open flame, as well as the obligatory hot drinks cabin. Just across from this market, you can marvel over the city’s best Christmas decorations on the posh Hotel d’Angleterre. 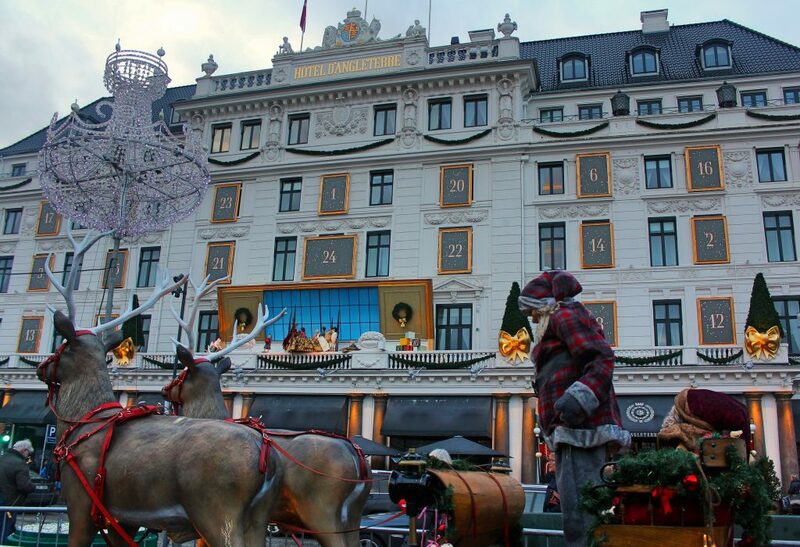 This year their display boasts an advent calendar made of framed LED screens, which reveal a festive image every day. 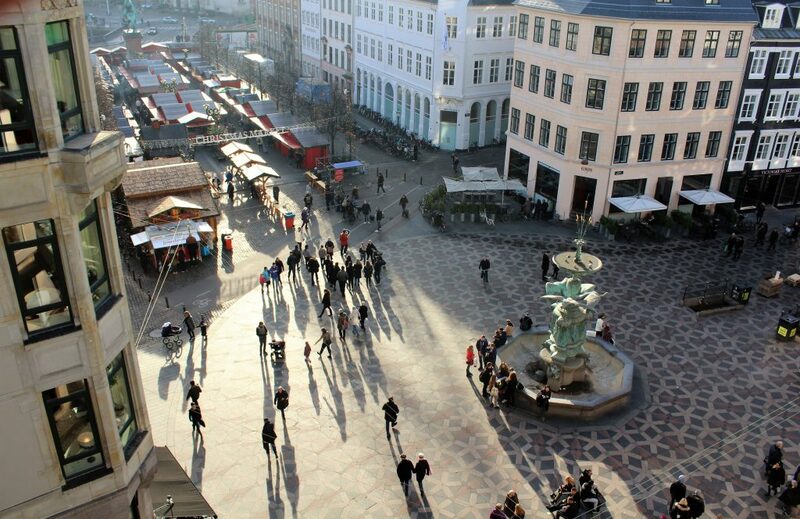 Højbro Plads market is the place for lovers of frankfurters and currywurst to get their fix, along with a tasty glühwein. The market’s red huts, thousands of lights and impressive decorations sit just of the bustling Strøget pedestrian street in the shadow of Christiansborg Palace. 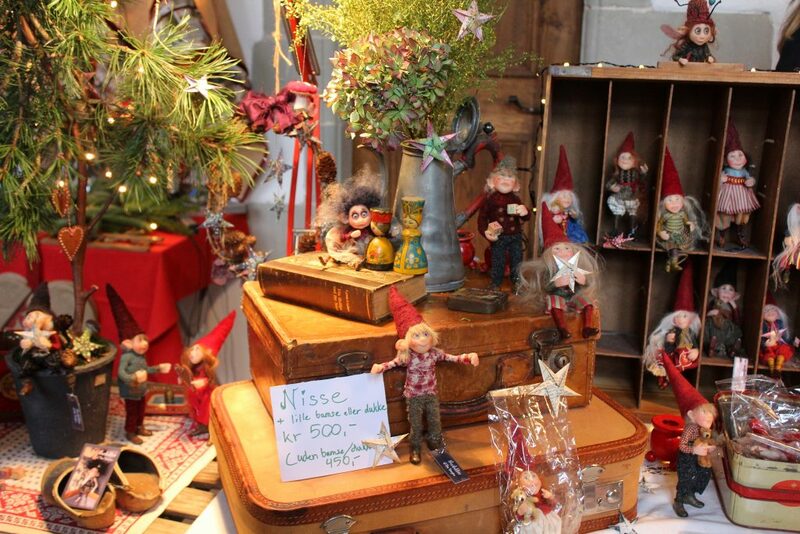 You can find a variety of handcrafts here, like paper lanterns, glass ornaments, and of course more woolen knits, as well as some tasty treats like chocolates and caramelized almonds, a Copenhagen Christmas must-try. 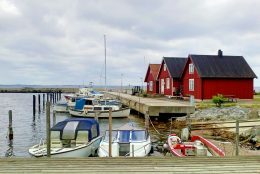 For something a bit different, head over the bridge to the island borough of Christianshavn and visit the annual market of the Freetown of Christiania. The Grey Hall is the setting for this community-minded market, where you can find some more unusual items, many of them handmade. 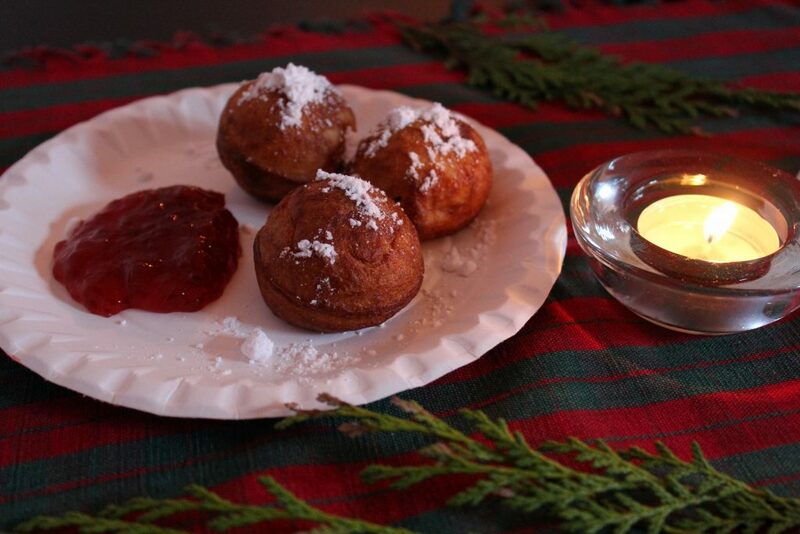 The Christmas goodies like gløgg and æbleskiver are far more affordable here than any other market. 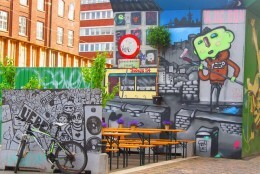 Just finished reading your article on Vesterbro, Copenhagen on lonely planet. Spot on about Vesterbro, thanks. Next time you’re there have a look at Soulscph (#eatlikeyougiveafork). It was truly the best food I’ve every eaten. Went back 3 times in 4 days. They just sent me a note they are opening in Vesterbro soon.